What is an aspheric lens? Is it a kind of lens? How is it different from polycarbonate or Trivex? These two are lens materials and undoubtedly the best in the business. But aspheric is a lens design. So what is so special about this design? Well, to begin with, let’s understand the difference between spherical and aspherical lenses. A spherical lens is when the lens is thickest at the centre and gradually thins as it fans out till the end. This is the most used design in all corrective lenses. The problem is, when the correction is for farsightedness the lens is really thick at the centre. This makes the eyeglass look a trifle ‘bulgy’ at the centre and thereby, a mite unattractive. With aspheric lenses, this issue of ‘bulginess’ is rectified. How? Simple, aspheric lenses have a more complex front surface that gradually changes in curvature from the centre of the lens to the edge. This ensures that the ‘centre thickness’ does not exist. Aspheric glasses mean fat is out, thin is in. Aspheric lenses are best made with high-index materials. The combination is potent, resulting in slimmer and lighter lenses. The difference between aspheric and conventional lenses is most noticeable in ‘plus’ lenses. Aspheric lenses can also be made for ‘minus’ lenses. The thickness of a ‘minus’ lens is maximum at the edges and reduces towards the centre. When aspheric lenses are used for ‘minus’ lenses, the difference is less visibly dramatic. Aspheric lenses reduce the magnification of the eyes. Far-sighted people often look a bit nerdy because of the way their eyes seem to boggle due to the thick eyeglasses made from conventional lenses. But since the aspheric lens is slimmer and flatter, the eyes are not magnified and look normal even though they are wearing such high-powered lenses. They also fit closer to the face, thanks to their flatter curves. Children are especially sensitive about their appearance. Aspheric lenses can prove to be particularly useful for them. Incidentally, the reverse is true for those with nearsightedness. Regular eyeglasses made from conventional lenses make eyes look smaller than normal, which is equally unattractive. But with aspheric glasses, the look is as close to normal as possible. Regular lenses cause a minor visual disturbance when the eye is moved from the centre to the left or right, or even below. As the eye moves from the centre of the lens there is a certain distortion. But aspheric lenses reduce this ‘distortion’ and give a better and wider and clearer vision. Aspheric lenses are lighter. So they are ideal for the elderly who are not comfortable with wearing heavy lenses. Most contact lens wearers overwear their contacts as they want to avoid wearing thick, unattractive spectacle lenses. Aspheric lenses are a great option for them, helping prevent overuse of their contacts. While the advantages of aspheric lenses are aplenty, there are a few key things to remember before recommending aspheric lenses to patients. Aspheric lenses are best for farsightedness and high degrees of nearsightedness, but they also come in good stead for other eye ailments like astigmatism, anisometropia, and presbyopia too. So, patients suffering from these eye conditions can be recommended aspheric lenses. A critical step in the dispensing of aspheric glasses is the selection of the correct frame. It’s not always about high fashion, especially in the case of aspheric lenses. As the lenses are a bit complicatedly made, it is important that the frame is of the correct size. Here, it is important that eye care professionals help patients choose the correct frame while explaining its importance to them. Aspheric lenses are flatter. That’s why they are more attractive, right? The fall-out of this is that the eyeglass will be closer to the patient’s face than the one made with conventional lens. This may cause reflection both in the inner and outer surface of the lens, which can cause problems ranging from annoyance to distractions to image blocking. Ensure to put an anti-reflection coating on the lenses. Perfection is everything when it comes to aspherics. A well-designed aspheric lens can result in excellent optical and cosmetic results. But aspherics are not as forgiving of dispensing errors as spherical lenses. If an aspheric lens is fit incorrectly, the lens may end up being optically worse than a conventional lens would have been. That’s why dispensing rules become more crucial for aspherics. Since the aspheric lens measurements are a little difficult, it requires an elevated level of skill and dexterity. Correct measurements require time. So do not hurry up the process. The customer is paying a high price for aspheric lenses and will be both disappointed and critical if the end result is not good enough. So take your time while scripting the measurements. As stated earlier, frame selection is important. It is best to recommend a frame that is not overly large. The frame should allow the eyes to be as centred as possible in it. Doing so will reduce asymmetry in the curvature of the front of the lens. Always apply an anti-reflective coating on the lens to reduce the reflections. There are many companies in the market that make aspheric lenses. But, for some people, precision that is generated through expertise and experience can be found only amongst the top gear lens companies, such as Essilor, Zeiss and Nikon. Let’s examine what these companies have on offer. 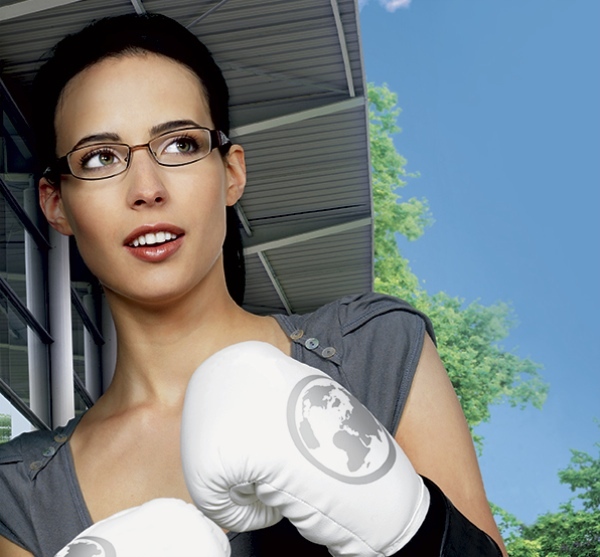 Essilor’s emphasis on clarity of vision, eye health care, safety and comfort ensures that the spectacle lenses it offers are impact resistant, lighter and thinner. Essilor’s special range of aspheric design is called the Airwear series. With a tagline that says, ‘lighter, safer and greener’, it explains the company’s commitment to long-lasting good eyewear. With the focus being on lightness and strength that are combined together to make the final product, Essilor brings to the table a special range of aspheric spectacle lenses. With a refractive index of 1.59 along with the aspheric design, Essilor states that the Airwear series is 30 per cent lighter and 25 per cent thinner than other lower index lenses. All spectacle lenses in minus power that are over 2D, have a centre thickness of 1.3 mm. Airwear spectacle lenses score in a few other areas as well. According to the company, it absorbs 100 per cent of the harmful UV rays. It also comes with a tough hard coat called ‘Titus’ that absorbs shocks, making this one of the most preferred scratch-resistant options in the range. This strength of Airwear spectacle lenses makes it best suited for any activity or occasion, from driving to high-activity ridden daily chores. The ZEISS Single Vision AS is an aspheric design crafted on a plastic base. It is rotationally symmetrical, has a flatter front and has superior visual quality. It is much thinner and flatter than the ZEISS Single Vision spheric lens. It is in fact 20 per cent thinner and lighter. The ZEISS Single Vision AS offers greater visual comfort and is aesthetically fine-tuned as well. There are two distinct advantages in wearing this lens. As the material used is plastic, it is an ideal option for children needing to wear corrective glasses. It is also ideal for sports professionals who would benefit largely because of its unbreakable quality. ZEISS was Europe’s first manufacturer of plastic lens to have successfully polymerised a plastic lens with the super-high index 1.665 for batch production. Since the polymerisation is done in-house, it is possible for ZEISS to provide such a quality product. The range is available in 1.74, 1.67, 1.6 and 1.5. Nikon is an expert in aspheric design. In fact, the unique aspheric design for eyeglasses is said to be borrowed from Nikon camera lenses and is considered as one of Nikon’s most outstanding achievements. Nikon recommends Nikon Lite AS for low to middle prescription wearers. The range is available in 1.5,1.56, 1.6, 1.67 and 1.74. All the Nikon Single Vision Lenses feature Nikon’s Advanced Aspheric Design. The bottom line promise is that the lens will not just be thinner, lighter and flatter and offer sharp, clear vision, it will look good and have limited peripheral distortion. Aspheric lenses have been a major breakthrough in the optical industry offering patients with high prescription, eyewear that is lightweight, distortion free, thinner and that offers more cosmetic value.